This 4 part fitness/lecture series discussing topics provided by Personal Trainers and Fitness Professionals hosted at the Social Staircase. All attendees are entered into a raffle to win a free InBody Body Composition Assessment. 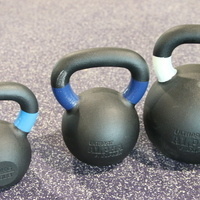 This session will provide instruction on proper use of working out with a kettlebell and different workouts that you can use in your every day workout routines. No registration is required for this event. Just show up at the social staircase at UREC!